The beating heart of southern Italy is waiting to be discovered. 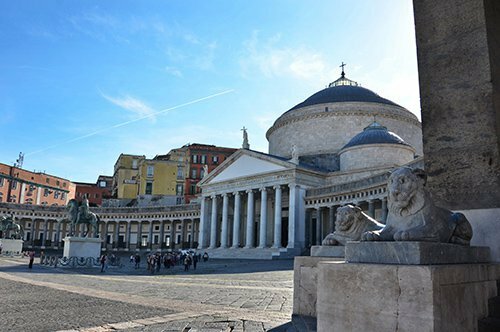 Naples will enchant you with its artistic treasures and its folklore.  A city unique in its kind, follow the Italy-museum.com advice and organize your visit! Between the seafront and the famous Via Toledo, you'll find the beautiful Piazza del Plebiscito that extends from the Basilica Reale to the Royal Palace housing the famous San Carlo Theatre. 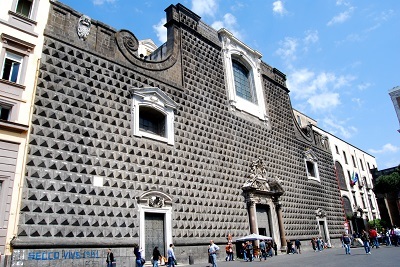 One of the pearls of Naples is certainly the Gesù Nuovo baroque church with its unique facade that contrasts with the sumptuous interior. One of the main streets of the Naples historic center which divides the city in two. It is one of the typical areas where art, history and culture come together in a perfect balance. The beautiful Santa Chiara Basilica, also known as the Monastery of Santa Chiara, is one of the most important churches of the city. 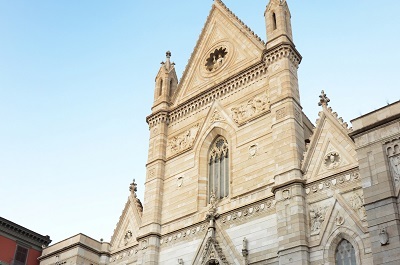 With a Gothic style encloses monumental cloisters and archaeological excavations. You can also admire some remains of Giotto´s frescoes. 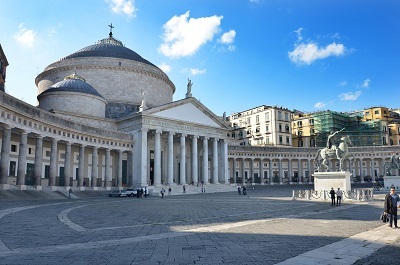 The Santa Maria Assunta Cathedral is the Naples Cathedral, the most important church in the city. Secular evolution fruit of the Gothic style houses every year the rite of San Gennaro´s blood dissolution. 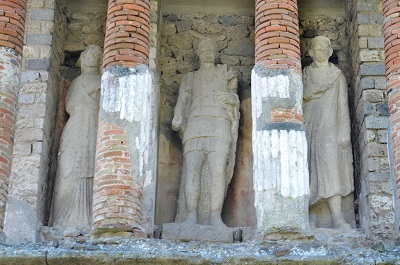 On the southern slope of Mount Vesuvius stood in ancient times a city with about 20,000 residents. 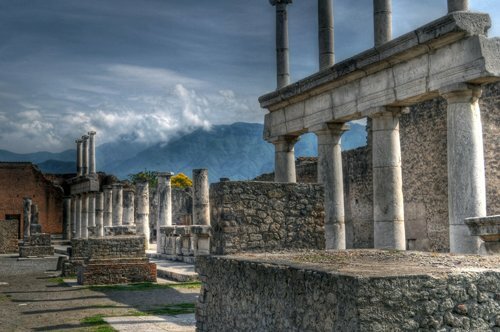 In the year 70 after Christ, this city called Pompeii was buried by the ashes of a violent eruption. 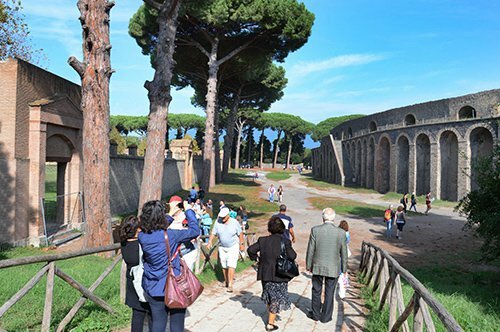 Today you can visit the remains of this ancient civilization crystallized over the centuries. 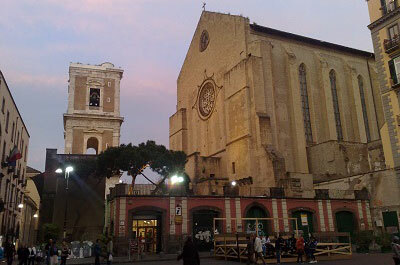 Naples offers various strategic places to stay it all depend on your needs. To stay close to the places of interest and to live in full the Neapolitan folklore we recommend you to stay in the historic center, in the area of Via Toledo close to the major tourist destinations, great for shopping and well supplied by public transport. If you prefer a peaceful area but still well connected to the rest of the city, we recommend you the Chiaia area. If you want to enjoy the view, you can go to Vomero or to Posillipo. 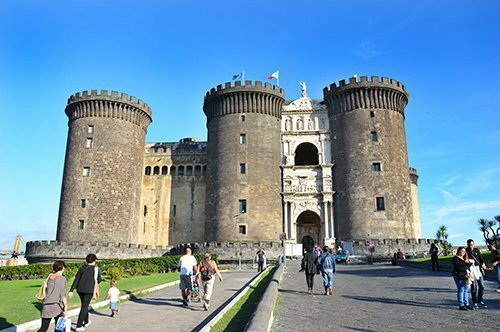 How to get to Naples? 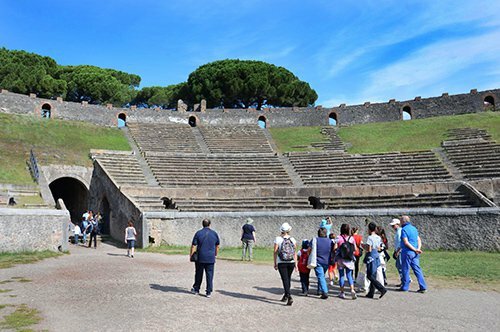 Being well provided with domestic transportation, we recommend getting to Naples by train or plane, avoiding in this way the problems of traffic and parking in case you arrive by car. The airport is well connected to the city and by public transport you can easily get to the center. The central station is very well connected from here you can reach any point of interest with the subway. Study well your shifts in the city considering that buses are subject to the city traffic. You can´t go to Naples and not try the pizza! One of the best pizzas we suggest you is Sorbillo in Via dei Tribunali. But Naples has more than pizza to offer. During your sightseeing, stop and taste the Neapolitan street food, the fried is the most popular! Donuts, panzarotti, or “o’ cuoppo” (paper cone with mixed fried fish), croquettes, fried pizza, but also “o’ brore e’ purp” (octopus broth) and “o’ per’ e o’ muss” (boiled pork parts and cooled season with salt and lemon). A must-try are the desserts including puffs, babà and the donuts of San Giuseppe. Don´t forget a good coffee.